Can Steven Spielberg help sell iPhones? Apple is betting on it. Analysis: When Tim Cook unveils Apple's new streaming service, the iPhone maker will join a growing field of companies that are vying for Hollywood's top talent. When Tim Cook unveils Apple's new streaming service on Monday, the iPhone maker will join a growing field of media, tech and telecom companies that are vying for Hollywood's top talent. But Apple is not trying to take on Netflix. Instead, Apple is hoping to augment a far more lucrative business: the iPhone and its other devices. For a wildly successful company, Apple faces a serious headwind. The sales growth of its core product — the iPhone — has slowed in large part because it sold too well. Apple saturated the market, and it’s becoming harder to get people who own old iPhones to buy new iPhones, upgrades that had been a major part of the company’s business. As a result, Apple is shifting its focus to services, a catch-all term for the software that makes owning an iPhone so valuable: music, news, fitness tracking, mobile payments, etc. 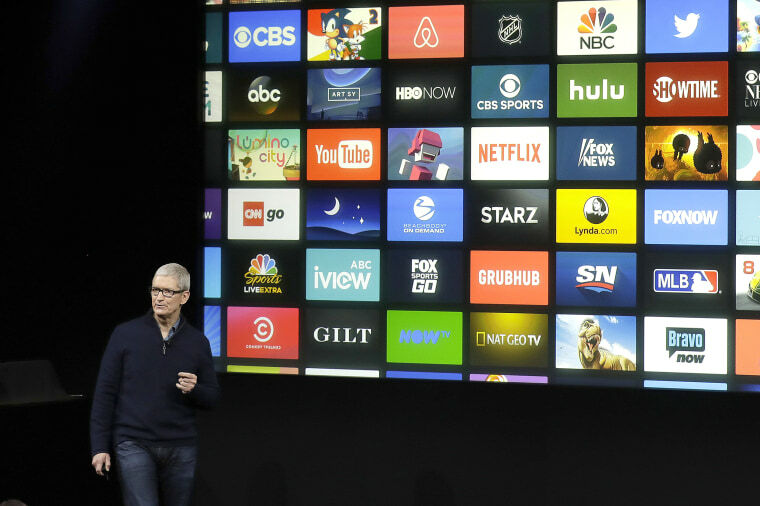 By bolstering these services, possibly in one convenient bundle, Apple hopes to shore up its user base and get people to spend more time with its product while also shelling out a few extra dollars. And to do so it will join forces with Hollywood. On Monday, Apple is expected to announce a new storefront for streaming services from established players like HBO and Showtime. But on top of that, Apple will layer its own premium original video content, much like Amazon’s platform. That division, led by Sony Pictures Television alums Jamie Erlicht and Zack Van Amburg, has deals with top talent like Steven Spielberg, J.J. Abrams, Reese Witherspoon, Jennifer Aniston and Kevin Durant. This is yet another Apple service, but it may also be among the most valuable if Apple can produce just a handful of “must-see” shows. As Matthew Ball, former head of strategy for Amazon Studios, wrote in May 2018, "video remains the most intensely consumed and valuable media category worldwide. It also generates outsized (and recurring) press attention and fandom." But what that video hasn’t generated is profit. Neil Cybart, an analyst who writes about Apple on his website, Above Avalon, wrote that the economics of streaming media remain difficult for companies like Netflix that are entirely about content. This is a calculation that Amazon chief Jeff Bezos made as well. Bezos did not create Amazon Studios and pay $250 million for rights to "Lord of the Rings" because he wanted to dominate Hollywood; he did it so that more people would sign up for Amazon Prime to get that content and then end up ordering toilet paper and laundry detergent through Amazon. Apple, Amazon and AT&T don’t need to churn out original content at a Netflix-level clip or start buying up major franchises, like Disney's Marvel and LucasFilm, to justify their forays into Hollywood. It will be enough to provide a little extra added value that convinces consumers to buy an iPhone instead of a Samsung or sign up for Amazon Prime instead of going to the grocery store. That said, it still won’t be easy for Apple. "Content is hard," Ball told NBC News in an email. "It takes time to build expertise, a robust content pipeline and to understand what audiences want from you (versus what you think they want)." One open question is whether Apple’s offerings will be available to non-iPhone users on platforms like Google’s Android mobile operating system, Roku streaming devices and Amazon’s devices. Rich Greenfield, a media analyst at the financial services firm BTIG, said there are pros and cons to making the service accessible beyond Apple. Powerful content is exactly what Apple’s talent lineup makes. If a company has to bet on a Hollywood director to persuade people to buy its product, they could do a lot worse than Steven Spielberg. Dylan Byers is a senior media reporter for NBC News and is based in Los Angeles.